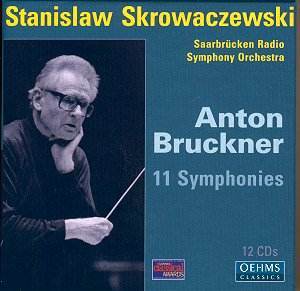 Stanislaw Skrowaczewski and the excellent Saarbrücken Radio Orchestra deliver good performances of the Bruckner symphonies throughout this appealing series of performances, recorded over a period of ten years. They include not only the fine �Symphony No. 0� but also the early �Study Symphony�, sometimes described as �No. 00�. Skrowaczewski makes out a good case for it too, with lean and athletic phasing and tempi that draw drama from the score at every opportunity. And this first disc in the set also includes a welcome bonus in the form of another early score, the Overture in G minor. The Symphony No. 0, another piece published only after the composer's death, is coupled with a further makeweight item, this time the Adagio from Bruckner�s String Quintet. Since Bruckner always wrote so effectively for strings this makes a most pleasing additional item. The Saarbrucken Orchestra may not have the advantage of having a household name and a great tradition of performing around the world�s famous concert halls, but they are undoubtedly a force to be reckoned with, aided as they are by these rich-bodied Arte Nova recordings. 'Die Nullte', as it has become known, is an altogether more mature and characteristic piece than the 'Study Symphony', and as such is fully deserving of a regular place in the Bruckner canon. This is by no means a mere curiosity, as the magnificent sweep of the opening phase will prove to any sensitive listener. As usual, Skrowaczewski judges the tempo to perfection. With most composers, the title Symphony No. 1 will suggest an early work. But �early� is a little too enthusiastic an adjective for this piece, since the composer wrote it during the middle years of the 1860s, when he had already turned forty. Nor is it really his First Symphony, since he had already written the F minor �Study Symphony� a few years before, while the symphony we now call �No. 0� comes chronologically in between the numbered symphonies 1 and 2. If all this seems indulgently pedantic, it�s actually rather interesting, since it tells us that Bruckner was slow to emerge as a major symphonist. Had he died at the same age (36) as Mozart, for instance, we would never have heard of him. The numbers �0� and �00� signify works which in the fullness of time have become valued, even though they were abandoned by the composer. The Symphony No. 1 was composed when Bruckner was working as organist of Linz Cathedral, a little before he made the move to Vienna, where he spent the major part of his remaining thirty years. It was the Linz performance of this work, directed by the composer himself, that gave him a significant reputation in that part of Austria, and this success did much to encourage his enduring commitment to the symphonic cause. In his later years the crisis of self doubt led him to revise the Symphony No. 1, but the over-complicated tendencies of the Vienna revision (1890) make it less satisfactory than the original version, which is what Skrowaczewski records here. Well might Bruckner have been encouraged by what he achieved in this symphony. The opening is immediately impressive, though the recording is rather less satisfactory than others in this series. Here and in the eloquent slow movement the dynamic range never quite opens up, and we are denied the full satisfaction of that glorious orchestral sonority which is such a hallmark of Bruckner�s greatness. The Scherzo was surely recorded on a different day. (The booklet gives the period 13-18 June 1995 as the dates.) For now the music opens out with the utmost clarity and range, and achieves what was denied in the earlier movements. Indeed the driving rhythms build to achieve a magnificently exciting climax, making this one of the most effective such movements the composer ever created. While the recording of the finale is also pleasing, the symphonic momentum does not have quite the sweep Bruckner achieved in the first movement. There are some splendid effects, to be sure, including a dramatic drum-roll which turns the agenda most dramatically in the later stages, but the music does not quite achieve the stirring peroration for which it strives. Skrowaczewski plays it for all it is worth, nor can the commitment and skill of his orchestra be doubted. The Second Symphony will probably never achieve the fame and popularity (if that is an appropriate word to use in relation to Bruckner) of the later symphonies. However, it is a substantial work of an hour�s duration, and in this performance Skrowaczewski achieves intensity as well as a truly symphonic sweep of momentum. Yet the music does not have the sheer epic scale that Bruckner would create as he grew older and more experienced. True, he did return to the score and make revisions � Skrowaczewski has opted for the 1877 version � but these did not alter the symphony greatly. The performance was very successfully recorded and sounds well. A feature of this work, in the first movement especially, is the telling use of pauses, out of which the music resumes. Skrowaczewski paces and phrases the music with exceptional sensitivity to these factors, bringing out its individuality, while the relatively resonant acoustic is helpful too. The choice of tempo feels right once again in the first movement, and there is some magnificent playing from the orchestra, including the cellos when they bring in their gloriously lyrical principal theme. This is a marvellous reconciliation of poetry with activity. The slow movement too has real eloquence, though the thematic material is not as memorable as we encounter from Symphony No. 3 onwards. The scherzo brings the most direct and powerfully rhythmic music in the whole symphony. The virtuosity of the orchestra is therefore put to the top of the agenda, and they emerge with flying colours, not least the trumpets and timpani, who are all on excellent form. On the other hand, the central trio is a poetic idyll, where sensitivity and subtlety are required. The finale is more diffuse, and at nearly twenty minutes it matches the length of the first movement, though not, I fear, its level of inspiration. However, this is a fine symphony, and during the final bars the sheer majesty of the sound sweeps doubts aside. In the Symphony No. 3 the first movement sets a rapid pace; more rapid, perhaps, than Bruckner intended. But Skrowaczewski makes a strong case architecturally, and only occasionally does the drive of the rhythmic momentum, rather than its vitality, push proceedings forward unnecessarily. For example, the big climax at the end of the development section can sound more exciting than this, when the conductor allows the rhythmic activity stemming out of the basic pulse to challenge the sonority of the chorale theme. However, this performance does move the movement through to a particularly powerful, emphatic conclusion. The slow movement is most effective. The pulse places the natural lyricism at the head of the agenda, and the beautiful playing of the Saarbrücken strings does justice to Bruckner�s inspired vision. The noble climax is at once structurally strong and sonically satisfying. This is a particularly subtle scherzo, with complex rhythmic interplays leading to imposing climaxes, with the contrast of a lilting ländler as trio. The choice of tempi and the qualities of the playing serve the music well. The same might be said of the finale, which starts with one of Bruckner�s most distinctive examples of the obsessive common-time rhythm which was his trademark. The second theme, is a remarkable fusion of polka and chorale. Bruckner said: �In the tavern there is music and dancing, while next door the master lies in his coffin.� This is perfectly done, the contributing strands at once balanced and clear in their articulation. It is not always so. This finale is a problematic movement, and Bruckner shortened it considerably in the version of the score played here. The music does not necessarily benefit, and there are sometimes suggestions that the symphonic logic has been undermined. But the quality of the invention is ample compensation, the more so when the sound is good and the playing better still. For the players of the Saarbrücken Radio Symphony Orchestra rise heroically to the challenge. Skrowaczewski, like many eminent Bruckner conductors before him, chooses the third version of this score, dating from 1889. In this symphony the process of revision was in the main a process of cutting, caused by the tribulations of its performing history. This is easy to prove by comparing some timings: Skrowaczewski (1889 version) takes 55 minutes, whereas Haitink (1877 version, Philips 422 411-2) takes 62 minutes. Longer still is Georg Tintner, in the first version (1873 version, Naxos 8.553454), which lasts a full 78 minutes. Originally Bruckner included various Wagner quotations, for he dedicated the music to that master, but in the revision process these were excised. Each of the three recordings listed here will give pleasure, and Tintner recorded a performance of the symphony which makes a strong case for first thoughts being judged as the best. But in truth each version has something to commend it, and at the bargain price this performance is worth having even if it becomes the second or a third in a collection. The spacious first movement of the Symphony No. 4 opens very atmospherically in this performance, the tremolando of the strings barely audible. The horn call of the movement's principal theme is the crucial factor, and is particularly well played. Out of it the music builds towards a massive, powerful tutti, before giving way to dialogues between woodwinds and strings and flowing lyrical music, the latter known as the gesängperiod (song-period). Skrowaczewski�s tempo feels slower than some, but there is no doubting the massive power he brings, while there are compensating contrasts of more flowing lyrical music. As the development ranges across these contrasted imageries, and the coda builds to majestic sonority, the thrilling writing for the horns duly makes its memorable impact. The Andante has an eloquent cello cantilena, and the whispering violin postlude is the perfect foil. This is a particularly effective rendition of this movement, with a restrained, meditative chorale and a beautiful melody for the violas. The climax is duly magnificent and epic. While this does not achieve the searching profundities of Bruckner's later Adagio movements, it remains wonderfully satisfying. The Symphony No. 4 was composed in 1874, but in 1878 and 1880 Bruckner revised it, replacing the original scherzo and completely reworking the finale. The work thus created received a successful premiere under Hans Richter in Vienna, on 20th February 1881. The chief reason for its initial success was the new scherzo movement, one of the most directly appealing examples of Bruckner's art. The atmospheric orchestration and stirring horn fanfares, with their hunting allusions, are balanced by a lyrical trio possessed of a magical calm. For this is a particularly impressive display of sophisticated orchestral sound in combination with instrumental virtuosity. The finale returns the symphony to a questing, powerful agenda. From the quiet opening a huge, massive climax is generated, and again there is lyrical music to provide the balance of contrast. Skrowaczewski opts for the Nowak edition and, like Herbert von Karajan in his 1970s EMI recording, adds a contentious cymbal clash at the peak of the climax of the first group. It is an effective enough gesture, but whether it emanates from Bruckner or from his disciple Franz Schalk is another matter. This finale is ambitious and full of searching music and powerfully forged contrasts, so that when the ending is made with the due return of the first movement�s principal theme, the effect is hugely impressive. The performance of the epic Fifth Symphony has a long-term structural command, but there is abundant textural detail along the way. In other words, this is a performance to reckoned with. It also does much credit to the recording team that it sounds better than ever in this reincarnation, and at the price it represents a quite extraordinary bargain, either as part of this set or in its single disc format. It is the two inner movements that impress most in Skrowaczewski's reading. As ever, he shows a keen appreciation of dynamic shadings, and in this regard as well as in the ambient sonorities, the recording serves him well. The scherzo is taken quickly, which is valid enough, but this does result in a few details of counterpoint being glossed over. For this is Bruckner's most overtly contrapuntal work, glorifying in the results his studies with his teacher Simon Sechter. The slow movement is as eloquent as one could wish for, with a flowing pulse but equally a real sense of gravitas as the climaxes build. The outer movements too impress in their pacing, with the strongly characterised themes returning to make an impact at once expressive and structural. The Saarbrücken Orchestra may not have the pedigree of the Berlin Philharmonic (whose recording with Karajan on DG remains a benchmark), but play the two 'side by side' and you will be hard put to tell the ensembles apart. The culminating passages of the symphony are hugely impressive, as a true peroration and summation. The results have much to commend them, though on the debit side the tension is perhaps allowed to sag just a little too much in the passage before the emphatic final bars. On the other hand, rarely has the balance between the brass instruments been so impressively communicated. There is no question that this is a noble and hugely rewarding performance of one of the greatest of all symphonies. The first complete performance of the Symphony No. 6 took place three years after the composer's death, when Gustav Mahler conducted a heavily cut version in Vienna. The music made little headway in its early years, with the result that it does not suffer from the complications of different performing editions which dog so many of Bruckner's works. The recorded music catalogue boasts more good performances of the Symphony now than used to be the case a few years ago, and the arrival of this excellent performance under Skrowaczewski strengthens the position still further. Indeed, anyone looking to add the work to their collection could really do no better than to invest in this budget price version in its single issue or as part of this set. The recording was originally made for Saarbrücken Radio in 1997, and it sounds splendid, with fully sonorous climaxes and great clarity and depth too. These things are particularly important in this piece, since Bruckner shows so many deft orchestral touches, not least in the nocturnal scherzo, which is full of subtleties of rhythm and texture. Skrowaczewski paces this music to perfection. The basic rhythm of the opening movement is notoriously difficult to articulate, but here it is clear in outline and beautifully judged in terms of pace. The description in the score is Majestoso, and Skrowaczewski certainly achieves a notable sense of majesty as the first subject unfolds from fragments to the first full climax. The flowing gesängperiod moves naturally and fluently out of this. The closing phase is expertly delivered too, the dynamics carefully observed in order to make maximum effect. This symphony has one of the great slow movements. The excellent string playing is captured with abundant richness of tone by the recording engineers, and again the dynamic shadings play a full part. For example, the third theme, a hushed funeral march, makes a particularly telling impression. With its various changes of gear, the finale is not without its problems for interpreters; but Skrowaczewski shapes it admirably. When the main theme of the work returns as if to close the book on the whole conception, the effect is compelling, as sonic satisfaction is combined with the deep inner logic of large-scale symphonic argument. There are few criticisms that can be levelled at this performance. Perhaps the rhythmic outlines might be more strongly drawn in the first movement, perhaps the playing might show more personality when solo lines emerge from the ensemble. But in truth such things hardly matter, since the effect of the whole is so satisfying. For this performance offers the listener a wonderful experience, and at bargain price too. It is a real highlight of this impressive collection. The recording of the Seventh Symphony is more than ten years old, dating from September 1991 and first released several years ago. It assumes a worthy position in the canon of these performances. For once again Skrowaczewski confirms his calibre as a Bruckner conductor, and once again the members of the Saarbrücken orchestra match his demands with first class playing. There is only one issue concerning the editions with this piece, of course. That is the question of whether or not there should be a cymbal clash at the peak of the climax in the great slow movement. This performance opts for the Nowak edition, which means the cymbal clash is included (in the Haas edition it is not). In fact it turns out that it makes little impact, both musically and sonically, and in that sense it is the most disappointing aspect of the performance. Now it may seem strange to write of a single cymbal clash being so important, since in many works - Tchaikovsky's Fourth Symphony, for example - such things are 'two a penny�. But in Bruckner the serious tone of the musical journey is such that a single moment of arrival means everything. Here that moment doesn't really come off, though thankfully there are other strengths in abundance, most notably the magnificent sonority of the orchestral playing in the fully scored passages. The tempi have that subtlety of tension and relaxation with marks out all the best Bruckner interpretations. For example, the first movement opens gloriously, with one of the composer's most inspired themes played with wonderful sonority, and with phrasing that allows the music to breath and grow. Then the more rhythmic contours of the secondary material make for an ideal balance as the large structure evolves across its twenty-minute span. The slow movement is deeply serious, at once majestic and noble. Skrowaczewski boldly plays it as a genuine Adagio, releasing the inspired themes stage by stage and with a long-term vision. The results are compelling, which is why the relative under-achievement (sonically speaking) of the biggest climax of all, replete with the dubious cymbal-clash, remains but a minor problem. At the end of the movement, the 'funeral music for the master', as Bruckner called his tribute to Wagner, is glowing and deeply felt. The Scherzo has abundant energy, and the principal trumpet plays at the top of his form in leading the way. The finale links back to the first movement material, the faster pulse broadening at the close with the return of the principal theme. For this is a glowing, beautifully judged performance. If the recorded sound is not quite as good as Arte Nova provide in other performances in the series, it is still perfectly acceptable. There are grounds for considering either the Eighth or the Ninth Symphony to be Bruckner�s masterpiece. The point is well worth considering, but surely the best definition in such matters is Hans Keller�s: that whenever we encounter great music it must necessarily sound as if it is �the greatest�. Skrowaczewski, quite rightly, plays the revised 1890 version of the Eighth, in which the first movement gains from that extraordinary hushed coda that Bruckner described as a �totenuhr� (death-watch). One of the tragedies of the recent history of Bruckner recordings was that Georg Tintner died before he was able to add the revised version of the Eighth to his otherwise complete collection on Naxos. The two versions of the Eighth give the lie to the easy generalisation that in Bruckner first thoughts are necessarily the best. For in this work there is no question that the converse is the case, a point of view that Skrowaczewski�s performance does everything to support. It is undoubtedly a performance to be reckoned with. The Saarbrücken Orchestra plays magnificently once again, and the blending of horns with Wagner tubas, a special feature of the work, comes through particularly well. Nowhere is this more important than during the magnificent concluding phase of the finale, when the recording gives due prominence to the orchestral sections contributing their crucial aspects of the display of complex contrapuntal mastery. The interpretation is compelling and inexorably controlled. Lest only the epic qualities of this great symphony lay claim upon our attention, let it also be said that the work�s many subtleties emerge naturally also. For example, Bruckner's harps make a special contribution, adding an extra dimension to the profound music of the Adagio. As for the revised coda of the first movement, the atmosphere is suitably sombre and deeply felt in its concentration. For this is an interpretation of the Eighth Symphony that is worthy of comparison with the famous recordings by its many devoted performers, such as Karajan, Horenstein, Haitink, Wand, Szell, Dohnanyi and Jochum. This interpretation of the Ninth Symphony is admirably paced, unfolding its splendours and its dark intensity at an inexorably correct pulse, although the element of mystery is somewhat downplayed (it is present in Bruckner�s title for the first movement: �solemn and mysterious�). That apart, symphonically speaking everything feels entirely natural. This sense of inexorable growth is really important in Bruckner, of course, since his style is expository rather than dynamic (uniquely among 19th century composers?). In the first movement the opening phase, so clearly modelled on Beethoven's Ninth in its sense of growth, builds to a massive climax, before the contrast of the more noble music which follows. Skrowaczewski�s phrasing of this is less mobile than some other interpreters, such as Günter Wand and Georg Tintner, but at the height of the development section, the moment of greatest tension in the movement, the effect is suitably imposing, while the coda builds to a noble final statement. The middle movement scherzo is pounding and dark, the central trio no less intense. In fact this performance seems to grow in stature and intensity as it proceeds. For the finale is broad in pace, yet full of sharply defined contrasts. There is an extraordinary world of visionary intensity at work here, and this makes the closing bars, with their resolution amid a mood of calm assurance and acceptance of fate, the more moving. There may be a handful of performances, including those of Günter Wand (RCA) and Herbert von Karajan (DG), which sound more subtle and sophisticated, but Skrowaczewski�s interpretation still makes a worthy and wholly satisfying conclusion to his richly rewarding cycle of the complete Bruckner symphonies. A particularly impressive aspect of this set is the consistently high standards of playing from the Saarbrücken Radio Symphony Orchestra, and the high quality of the recorded sound too. For getting the right sound is crucial with this composer, and this may actually have been a significant factor behind the difficulties that he experienced with the early performances of his music. These twelve CDs come in a well produced and attractive hinged box, and while the booklet notes by Barbara Dobretsberger are relatively brief they are full of interest. They also contain much of the necessary information about the editions Skrowaczewski has chosen to perform. It is a pity that this information was not displayed more prominently in the context of a listing of the symphonies, including all the movement details. For the latter are entirely missing from the booklet, and this must surely have been an editorial error rather than a deliberate decision. However, it would be wrong to view this as anything other than a small frustration in the context of giving a hearty recommendation to this truly excellent collection of the complete symphonic output of this wonderful composer. Even the collector who already possesses this repertoire in alternative performances will find this set well worth exploring.